Video & 4x4 Adventure form. Video & 4x4 Adventure Form For Booking. Please fill out the Video & 4x4 Adventure form below to sign up for the tour. At this stage, payment is available by EFT and PayPal only. If you are using EFT, please E-Mail us a copy as proof of payment because it can take 3-4 days before it shows up in our bank account. To secure your place a deposit of $50.00 must be paid at the time of your booking and the remaining amount is to be paid at the latest 30 days before departure. There is only room for 2-3 cars on these tours so it is important we receive your deposit ASAP. First, to pay deposit is locked in on the tour. cars already on each trip. Video & Adventure Trips Tag Along Form. 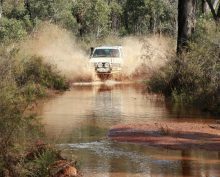 Leave 4x4 Adventure Form And Go 4 Wheeling In Western Australia.